When you are looking for paint sprayer products on the market, you will encounter handheld products among other prominent options. Some products are large and will require a cart and a hose to be able to work efficiently. The handheld units are relatively light and easy to use, making them one of the best sprayers for handling DIY home projects. Their design allows you to use, control and spray with just one hand. Investing in a handheld paint sprayer is, therefore, one of the best things you can do. These sprayers have what it takes to tackle smaller outdoor projects like painting fences, garden furniture, and mail boxes. Hand held units are designed to handle various types of furniture including dressers, bookshelves, and cabinets. These sprayers allow you to control the spray patterns and eliminate the mess that is usually created by many other types of paint sprayers. There are many handheld sprayer brands and sometimes it can be quite challenging trying to figure out the which unit fits your painting needs. However, below you will find the best hand-held paint sprayers for sale. The sprayer has a high-pressure piston pump that can be used on denser materials like acrylic and latex. 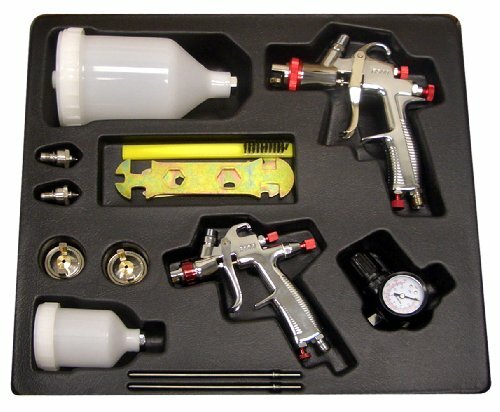 It comes with three spraying modes to give you precise control over your painting patterns and projects. This sprayer has a Triax triple-piston pump that has the capacity to deliver a tip pressure of 2,000 pounds. This unit saves you time and money as it is affordable and can be quickly set up to handle any indoor or outdoor painting activities. It uses a turbine motor to power up which eliminates the need for an air compressor in your painting projects. The first stage gives you perfect spraying for indoors and the second stage gives you perfect spraying for outdoors. 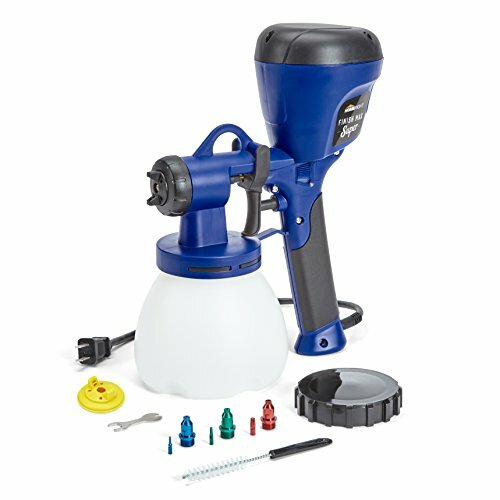 The Graco 17A466 Paint Sprayer combines speed, precision, control and true airless spraying technique to give you a professional finish for your painting projects. The unit has a dual control system that offers two speeds which delivers less overspray and precise control. A new technology called FlexiLiner paint bag system is also included that allows you to spray in any direction. Even if the unit is facing upside down, it allows you to spray without any hiccups. The sprayer has a high-pressure piston pump that can be used on denser materials like acrylic and latex. The TrueCoat 360DS sprayer has been made from high-quality materials and comes under standard graco paint sprayers in the line. 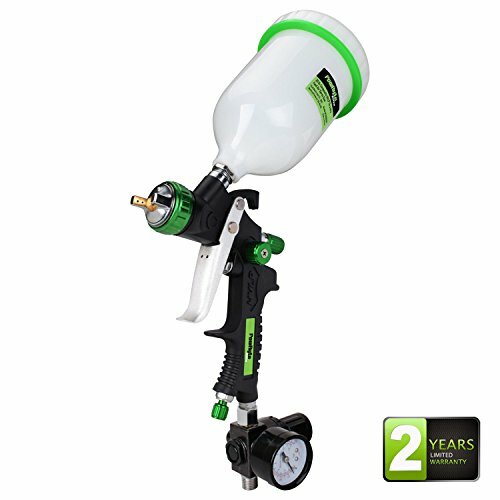 This sprayer has a great design and requires no prior experience to use. You get two spraying patterns with this unit where the first pattern is a narrow pattern which is usually used to paint slender areas like joists and fences. The second pattern is a wider pattern which works well on surfaces like chairs, doors, and closets. The Flexiliner technology makes it easy to maintain this machine by allowing you to throw away the supply cups and replace them with new ones. Its nozzle is detachable and can be safely submerged in warm water for efficient cleaning. Its ease of use and overall performance makes this unit a great tool for any DIY enthusiasts. 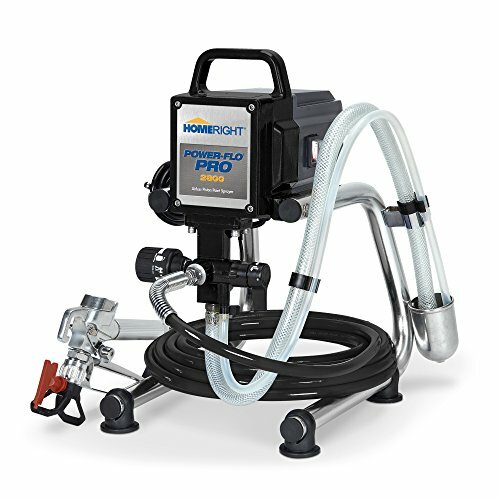 The HomeRight C800766 is a well-designed HVLP sprayer that offers excellent performance for small projects like furniture and cabinets. It comes with three spraying modes to give you precise control over your painting patterns and projects. A 400W motor is located in the upper section of the casing and works in a similar way as a vacuum cleaner motor. This motor has the ability to blow materials and move the air on any working surface. Unlike other high-pressure units, this machine utilizes low pressure to give you less overspray and higher transfer rate for the material. The homeright finish max comes with additional accessories to assist you to change the nozzle patterns. 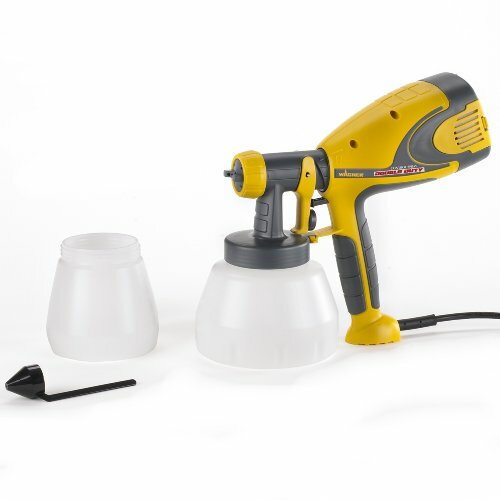 Viscosity cup is one such accessory and it helps you determine the optimal viscosity of the paint material. The user manual has a sheet that explains the time period required for different materials. The unit has an adjustable nozzle and the interior parts are made from high-quality brass. This ensures less wear and more durability for the nozzle. By rotating the nozzle, you can control the spray-pattern. One of its crucial features is the flow control knob. This knob is found on the trigger and it regulates the flow of air along with the power delivered by the motor. The blower nozzle is the other accessory that helps with preparing the surface and applying finishing touches. 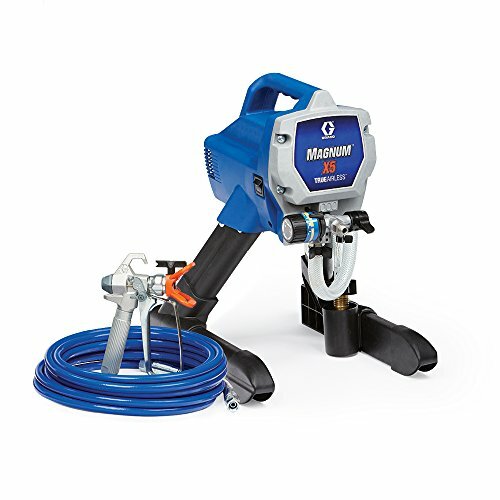 The Graco Ultra cordless paint sprayer unit is an airless portable sprayer that utilizes the power of the DeWalt 20V Max batteries to deliver flawless finish, unbeatable speed, and top-notch reliability. Being an airless handheld sprayer, it is an essential tool that can be used to get the job done quickly and efficiently. This sprayer has a Triax triple-piston pump that has the capacity to deliver a tip pressure of 2,000 pounds. Apower dial is included to assist painters in adjusting the tip pressure. There is also a reversible and removable RacX tip to ease-up the unclogging process. Whether you are a DIY homeowner or a professional painter, the Graco Ultra 17M363 sprayer is a fundamental tool for enhancing your painting experience. This is one of the most user-friendly paint sprayers on the market for under $700. It has a ProConnect Pump Replacement System that enables you to remove and replace the side panel using a Phillips head screwdriver. Its TRIAX Piston Pump allows for longevity and better durability. The pump has stainless steel and carbide components that give it the capacity to handle heavy duty jobs. There is a SmartControl Pressure Balance feature that enables painting at various speeds over the paint surface and prevents rough finishes and eliminates the need to go back over certain spots. A 32-ounce FlexLiner bag is included to allow for easy cleanup and quicker interchange of paints. The PaintWIZ Handheld paint sprayer uses the High Volume Low Pressure (HVLP) technology to paint thinner materials like stains, urethanes, sealers, lacquers, and varnishes. It is a high-quality spray unit designed for DIY enthusiasts, home users and professionals. This unit saves you time and money as it is affordable and can be quickly set up to handle any indoor or outdoor painting activities. With this sprayer, you don’t need to waste time with brushes, pans, and rollers. It comes with a powerful 400W motor, ideal for both indoor and outdoor jobs. An all-in-one system allows this sprayer to paint four times faster than the ordinary brushes and rollers. The effective HVLP paint sprayer that delivers low overspray and supreme control features that can handle spraying of sealers, stains, and other thin materials. One of its key features is the three-spray pattern setting. This setting provides horizontal & vertical wide spray patterns as well as the circular pattern. The horizontal pattern allows you to spray a wide width from the top to bottom. The vertical pattern allows for spraying large surfaces like walls from side to side. The circular pattern uses less overspray and is perfect for corners, edges, and other smaller areas. There is also a full control dial that delivers precise application and less wastage. The HomeRight C800971 is one of the newest tools from the HomeRight series. It comes with superior features and capabilities to cover a wide range of painting projects. This includes fences, cabinets, furniture, and walls. Being an HVLP unit, it handles most projects with less hassle and thinning. 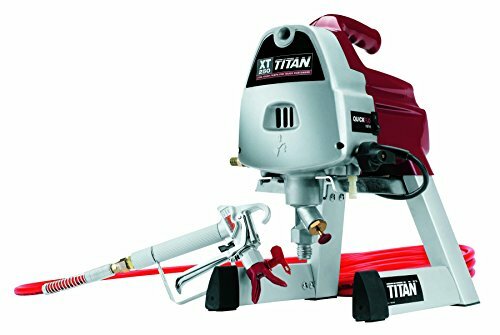 It uses a turbine motor to power up which eliminates the need for an air compressor in your painting projects. The motor generates up to 450 watts of power which is sufficient enough to work with thicker paints. 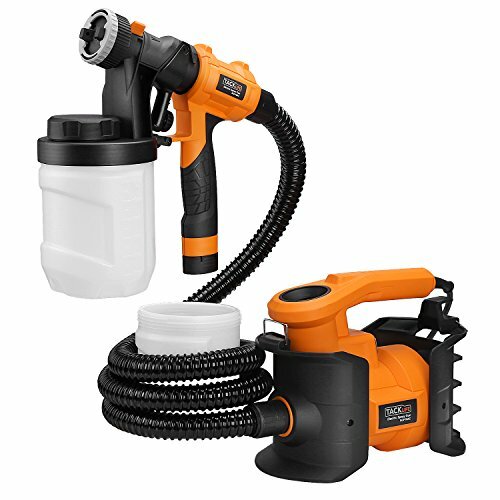 It has a large capacity container that is able to accommodate 39-ounce of fluids to enable you to spray large areas without having to constantly refill. The versatility of this unit lies in its six available spray tip sizes not only that it is less expensive $100 paint sprayer available. Three of these sizes are included in the initial purchase and allow you to get started immediately. The six sizes give the ability to handle different projects without losing speed and momentum. There is also a volume control knob that gives the necessary customization features to work with the different tip sizes. An inbuilt access door allows you to quickly access the sprayer’s inlet air filter in order to change it. 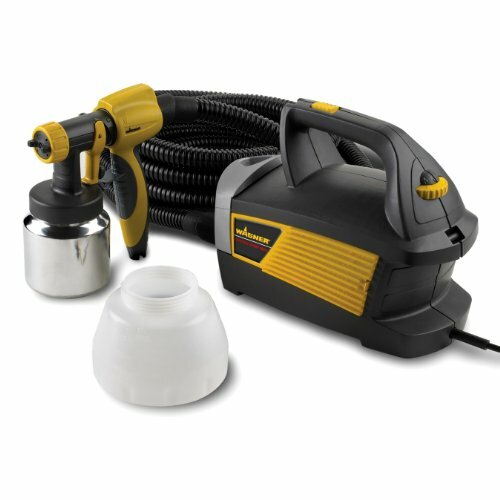 The 450W power combines with adjustable air cap to atomize the paint into small particles necessary for a factory-like finish. With this unit, you will experience faster results with more professional coating. Our next pick has a number of features that allow you to paint surfaces in no time at all. The first feature that the sprayer has is the quick disconnect cartridge. The next feature that is included is the ability to switch between two different stages of air flow from the air turbine. The first stage gives you perfect spraying for indoors and the second stage gives you perfect spraying for outdoors. This means that you will always get the perfect finish no matter what painting task you are working on. The three-position air cap on the sprayer means that you can choose either a vertical fan, horizontal fan or round shapes in order to get the best coverage required for your job. 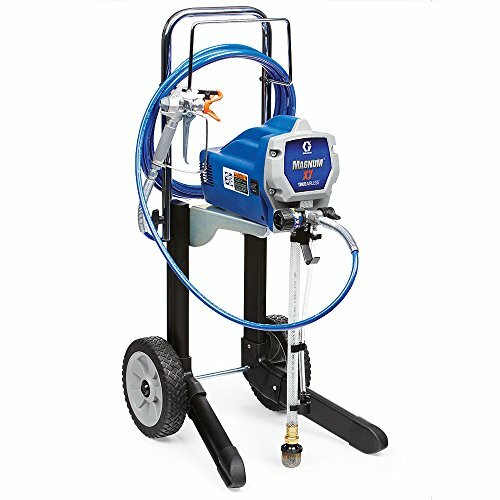 This product of wagner paint sprayer also uses a high volume low-pressure system which allows you to spray thin materials, such as lacquers and varnishes. This means that you can use something other than paint in your sprayer to achieve the finish that you desire. It also comes with two different material cups for loading. The first holds 1 quart and is used for interior work and the second holds 1 quart for exterior work. This means that whatever your needs, you will be able to carry out your job with aplomb. There is even a dual stage motor to ensure that the sparks do not ignite any flammable materials you might be using. Therefore, you can use whatever material that is perfect for your needs with no worries about what might happen when you use it. 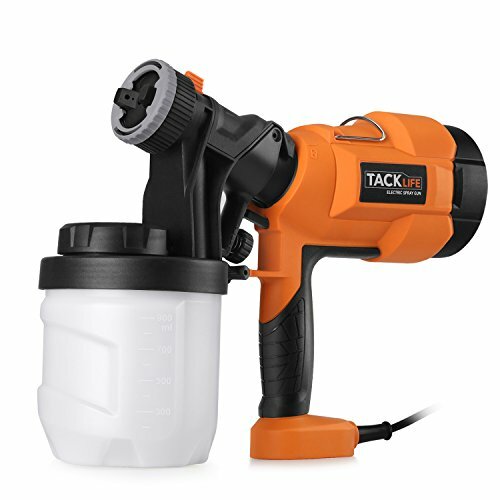 The Tacklife SPG15AC Advanced Electric Spray Gun is perfect for any paint job you might need to complete. It has some fantastic features that make it a great product to assist you with your painting needs. The detachable design of this spray gun means that you can clean each part individually. This makes it a lot easier to ensure that you never get any clogs or loss of performance. Therefore, with every use, you will get even coating. It also has a long power cable that helps in cases when you need to move around a lot in order to complete the job. If you’re painting in huge areas, then the long power cable means you can reach it easily. The heat that is created by the spray gun also goes towards assisting the motor for the air turbine. This means that it is energy efficient and will work better for longer without increasing your power bills. The wide range of settings that are included in the spray nozzle means that you can spray any kind of surface for any situation. With three different spray patterns included in the nozzle, vertical, horizontal and circular you can get an even spread with ease. The width control lever also allows you to increase the precision of your spray gun, so you can get right into those tough corners without coating the rest of the room in the process.It’s easy to fill up too, with the large 900ml container allowing you to fill it up directly with paint so you can instantly get straight to the job of painting. This painting tool saves you time and effort and the large capacity means that you don’t have to fill up as often either. There are several factors that will guide you in choosing the best handheld paint sprayer on the market. They include the holding capacity, materials, spray patterns, warranty, and motor. In terms of the holding capacity, you will need to know the amount of liquid the sprayer’s cup can hold. Commercial models usually have a hook and hose for connecting to a large capacity container like a bucket. The handheld models, on the contrary, have a cup attached to it. The size of cup determines the holding capacity of the sprayer. If you are going to work while standing on a ladder, it is important to keep the weight down by having a smaller cup. A larger cup will be ideal for more extensive jobs. The next thing to consider is the ability of the sprayer to handle different materials. A good handheld sprayer should be able to do more apart from painting. For instance, if you are going to work on wood furniture and decks, then you require doing some staining. A handheld sprayer that handles both painting and staining will, therefore, be a better choice than one that focuses only on painting. You also need one that accommodates water and soap for easier cleaning purposes. Each product offers its own spray patterns. It is therefore important to consider the options for spray pattern before making a purchase decision. The vertical and horizontal patterns will be sufficient for many applications, but the round pattern is helpful in coloring large surfaces. There is also the warranty factor that you need to consider. The purchased unit need to have a good warranty period to guarantee the longevity of use. The standard period is one year, although most brands are offering a two-year warranty period. It is good to also look at what is contained within these warranty covers. Some companies will require you to send the unit for repairs. There is then the motor speed factor. Some models offer you one-speed motor while others have a variable speed motor. The one speed will take a long time especially if you are coloring a large surface like a wall. The variable speed unit will give you the freedom to choose a perfect speed that meets your requirements. Handheld sprayers come with several features that make up the unit. These features can give you a headache to choose, especially if you don’t understand them. The key features that should determine the choice you make are portability, flexibility, power, and cleanup. Most handheld sprayers are portable to enable you to handle easily both small and large-scale projects. Under portability, you will need to choose a sprayer that is compact enough to handle a variety of tasks. For cleaning purposes, you will need to choose a model that can be easily disassembled. Such a model can be attached to a common garden hose for easier and faster cleanups. The flexibility of delivering paint to your required surface will be a key factor in choosing a handheld sprayer. Some models give you the chance to set the paint dispensation options for different levels of thickness. There are those models that have multiple speed settings. Still, there are others that give you the chance to choose the various spray patterns. Before buying your handheld sprayer, it is good to consider a model that gives you the flexibility of working with different settings. Handheld sprayers can be powered in a number of ways. The first set of handheld sprayers uses cords and it can be controlled by operator’s hand. There is then the cordless set that can be used to access tight spaces. The third option is the fuel-powered sprayers. The choice of which one to purchase will largely depend on your working environment. There are other features that make the different brands stand out. They include the use of the HVLP (High-Volume-Low-Pressure) technology, the lock n go features, a two-position hopper, ProControl, and the tilt-n-spray feature. They may not apply to all models but are key considerations that can make your model achieve better and faster results than other models. Handheld sprayers are probably some of the best on the market especially for those people who need high productivity and mobility. This tool enables you to paint different kinds of surfaces in an efficient way. It can be conveniently used around the home area and it falls within the affordability bracket for many users. There are many such devices on the market and they tend to confuse buyers on which brand to buy for their painting needs. We have explored some of the things that will guide you towards the perfect tool that addresses your requirements. Therefore, this buying guide highlights some of the essential features you must consider and other optional features that may be desirable. A model that satisfies these factors will give you excellent results and will make the painting process using handheld sprayers a fun experience. With these detailed information, you will be well on your way to choose the top-rated hand held paint sprayer that perfectly matches your demands.